Since 1981 we regularly traveled to West Africa. This is the area of origin of the Azawakh. In this area, we got to know these very elegant and natural dogs in their own environment. Fascinated, we decided to model our dogs on their African counterparts. We started breeding in 1990, having imported our first male Azawakh ‘YARIS’ from Niger and our first female ‘DAZOL’ from Mali. 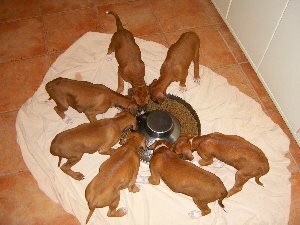 Our puppies are raced inside our home, always close to our adult Azawakhs and our family. While Azawakh breeding is a hobby for us, our aim is to produce a well-rounded hound that can be a friendly and elegant family dog. Our Azawakhs are bred to be “allrounders”. They are equally at ease competing in recreational racing and shows and to live as beloved companions.